Universal remote bypass oil filters for gasoline engines and other diesels. NOTE: The billet adapter accepts the Ford OEM full flow oil filter or an AMSOIL EaO98 (the full flow filter is not included in the kit). NOTE: The Power Stroke OEM full flow oil filter is not included in the kit. NOTE: Nissan 5.0 requires the separate purchase of a BK 1104 filter adapter. Call 888-428-3319 to order the BK 1104 adapter. 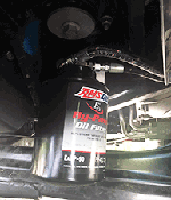 JIC fitting for oil supply from the OEM oil filter manifold. NOTE: The EaO80 fullflow oil filter is not included in the kit. For superior filtration on heavy-duty gas & diesel large-sump applications. To include class 6, 7, 8 trucks and off-road heavy equipment. Supports sump capacities of 15 quarts to 42 quarts. Purchase the engine spin-on adapter separately. Call us for assistance with adapter & filter selection for your engine. 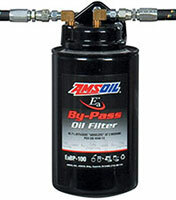 Links two AMSOIL EaBP bypass oil filters together for sump capacities of 20 - 42 quarts. 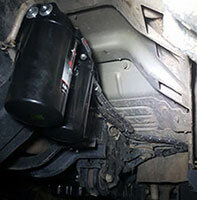 Includes: Oil filter mount assembly (powder coated) that mounts two ByPass oil filters. Consider the AMSOIL Dual-Guard Kit for these applications: Stationary Engines - Large Compressors - Electric Generators - Construction - Filter-Pump Carts - Marine, Forestry, Mining - Agriculture & Irrigation. Purchase Billet Caps separately (see below for Ram and Ford specific data). NOTE: The BMK21 Power Stroke and Cummins installations shown below are for reference. With the introduction of the BMK31 (6.0/6.4 Power Stroke) and BMK34 (2004 & later 5.9/6.7 Cummins) bypass kits, FORD and 2004 and later RAM owners no longer need to purchase the individual bypass components. 2003 and earlier 5.9 Cummins still use the BMK21 kit. The photos below might still be helpful in understanding the kit components and give you some installation ideas. 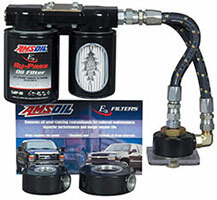 NOTE: AMSOIL has combined the components below into the BMK34 Single-Remote ByPass Oil Filter Kit for 2004 and later Cummins. AMSOIL BMK21 for RAM 5.9 and 6.7 Cummins. 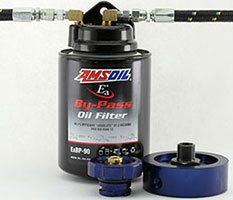 Select one of the AMSOIL bypass oil filters; either the EaBP90, EaBP100, or 110 has the capacity to support the 5.9 and 6.7 Cummins. 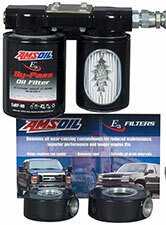 The three items shown below (BK1303, BP241, BP242) are available to simplify/ease the bypass oil filter system installation on a Cummins. 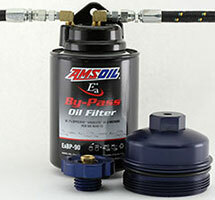 For 2003 and earlier 5.9 Cummins, use the BP89 oil return fitting (included in the BMK21 Kit) to return oil to the engine through the OEM engine oil fill cap. BP241 is a straight JIC fittling used to screw into the top of the OEM oil filter manifold/filter head to provide pressurized oil to the AMSOIL BMK21. Some installers prefer to use the BP242 (90 degree) on the filter head. Use the fitting that makes sense for your installation. 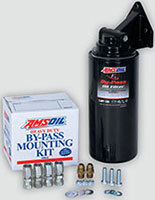 NOTE: AMSOIL has combined the components below into the BMK31 Single-Remote ByPass Oil Filter Kit (click here). AMSOIL BMK21 installation shown for the 6.0 and 6.4 Ford Power Stroke. The three items show below (BK1102, BK1101, BP242) are available to simplify/ease the bypass oil filter system installation on a Power Stroke. For 6.0 and 6.4 Power Strokes to facilitate return of filtered oil from the AMSOIL BMK21 bypass unit back to the engine, Center rotates to allow oil servicing without disconnecting the return line. For 6.0 and 6.4 Power Strokes to facilitate pressure oil to the AMSOIL BMK21 bypass unit. The BK1101 billet cap replaces the OEM oil filter cap. BP242 (2 each) is a 90 degee JIC fitting used on the BK1103 (above) to connect the return oil line to the billet cap. 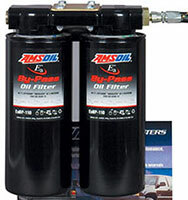 These filters will fit the AMSOIL ByPass kits shown above. The EaBP 120 fits only the BMK30 Heavy Duty ByPass Kit. EaBP 120 bypass oil filter (12,1" long) is for the BMK30 kit only, with crankcase capacity of 24 to 60 quarts. Increases oil capacity 1,0 (one) US gallon.